Chiswick- based TV presenters Ant McPartlin and Declan Donnelly have picked up yet more awards at Sunday night's Bafta, for the second year in a row. The duo, known as Ant and Dec, won Best Entertainment show and Best Entertainment performance for their ITV show Saturday Night Takeaway. Ant McPartlin told the audience: "What a great start to the show - for us. We're delighted with it, thrilled." Last year Saturday Night Takeaway won two Baftas, for best entertainment show and entertainment performance. 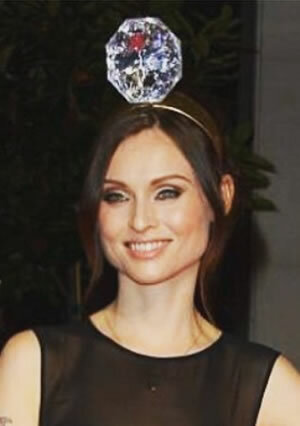 Chiswick singer Sophie Ellis-Bextor turned heads when she arrived with a giant jewel on her head. She accessorized her black and white House of Fraser dress with a headpiece featuring a large fake diamond, from milliner Piers Atkinson. The East End based business has designed hats for celebrities from Dame Shirley Bassey to Rihanna. People took to Twitter to comment on her outfit, with one quipping: 'Sophi(e)sticated as usual' .